Vegan dieters may experience bloating for several reasons. A sudden increase in fiber intake from fruits, vegetables, and legumes is one main culprit. Fortunately, if you're following a vegan meal plan and bloating is causing you problems, there are several ways to combat this unpleasant symptom. 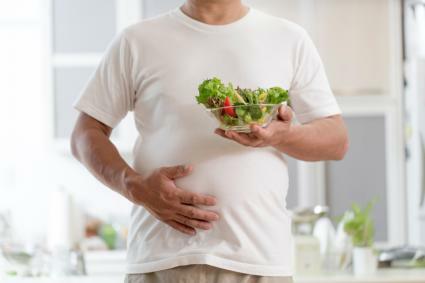 An anti-gas enzyme supplement called Bean-zyme helps improve bloating caused by gas-producing foods like beans, broccoli, cabbage, and soy. Bean-zyme contains no animal products, so it is well suited for vegan dieters. Take this supplement when you begin your meal, especially if you're about to eat a plant-based food known to cause gas and bloating. What Causes Some Vegetarians to Become Nauseous and Dizzy? Several studies show peppermint oil is beneficial for people with symptoms of irritable bowel syndrome (IBS) -- including gas and abdominal bloating. One such study published in 2016 in Digestive Diseases and Sciences found peppermint oil is safe and effective for treating IBS symptoms and provides rapid relief. Believe it or not, regular exercise may help reduce bloating, according to a 2011 review published in Gastroenterology and Hepatology. Authors of this review point out that physical activity, such as using a stationary bike, reduced symptoms of bloating in one study. A 2012 review published in ISRN Obstetrics and Gynecology also suggests participating in physical activity, including abdominal exercises, to ease abdominal bloating. Taking probiotic supplements or eating probiotic-rich foods like yogurt is also an option when you want to ease bloating according to the 2011 review in Gastroenterology and Hepatology. Authors of this review cite several studies that show taking probiotic supplements reduce symptoms of bloating and abdominal discomfort. The author of the 2012 review in ISRN Obstetrics and Gynecology also suggests eating yogurt as a way to manage abdominal bloating. While vegan dieters don't include cow's milk yogurt in their daily meal plans, dairy-free vegan yogurts containing probiotics are available. If you've tried everything and are still feeling bloated, ask your doctor about taking an antibiotic called rifaximin. A 2013 review published in the Journal of Neurogastroenterology and Motility found that rifaximin relieved bloating and abdominal pain in patients with irritable bowel syndrome and can be used long term with little risk of side effects. A vegan diet might be the culprit when you're feeling bloated, but that doesn't mean you have to suffer. Many natural remedies, over the counter medications, supplements, and lifestyle changes can help ease your symptoms. Advantages of Vegetarianism By Erin Coleman, R.D., L.D.